Astrid Nielsch, who completed the Science Fiction and Fantasy Art Course has written us a truly inspiring piece for our college news blog, along with three beautiful pieces of her artwork below. We are thrilled that Astrid is doing so well with both her artwork and her studies and we wish her every success in her future endeavours! One of the questions my tutor asked me when I had freshly enrolled in the Science Fiction and Fantasy Art course a few years ago, was “What would make you feel that taking this course was worth your while?” – I hummed and hawed for a bit, and then settled on “I’ll consider the course a success if I start getting paid for my work”. I felt a bit guilty about being so money minded. Was I setting the bar too high? So I am quite happy to report that in the meanwhile, I have landed a couple of paid illustration commissions. I’ve done several sets of illustrations for the New Zealand Open Polytechnic course materials – an opportunity that opened up because I am studying for a horticulture certificate through the Open Polytechnic at the moment (I think it is a nice combination with my art certificate, as I can now grow my own food! 😀 ) — and my tutor hired me for this job when I told her about my studies with London Art College. So that worked out quite nicely, and yay for distance studies! Last year, a friend and fellow artist invited me to participate in a group exhibition he was organizing in one of the up and coming art galleries on Cuba Street (Wellington’s artsy part of town). 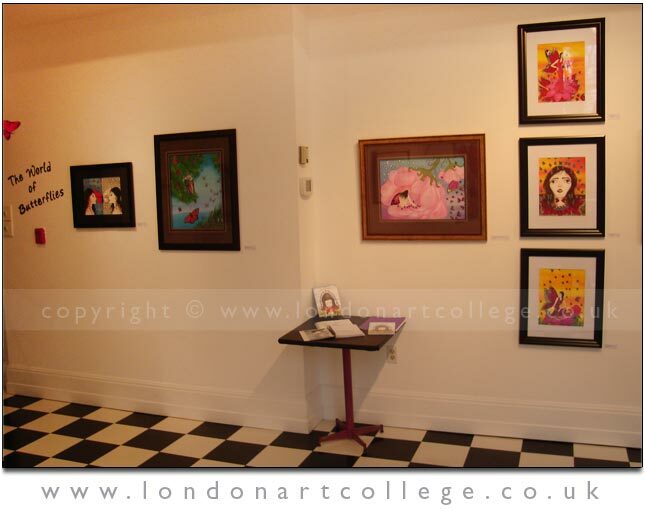 Since then, I have had two more exhibitions at the same gallery, and even managed to sell some of my digital prints! I have also listed them on Ebay and a couple of other online stores, and am making the occasional sale there as well. My next project is to get my website www.starsongstudio.com up to speed and have a proper online store – and make more pieces that I can sell as posters or greeting cards. But first, I want to finish the project I am currently working on, an illustrated children’s book based on a traditional tale from Estonia – where some of my family roots are. It is a project which has been in the drawer for the last five years or so, ever since I wrote up the story for a weekend course on “how to write and illustrate children’s books”, taught by a local writer and artist. 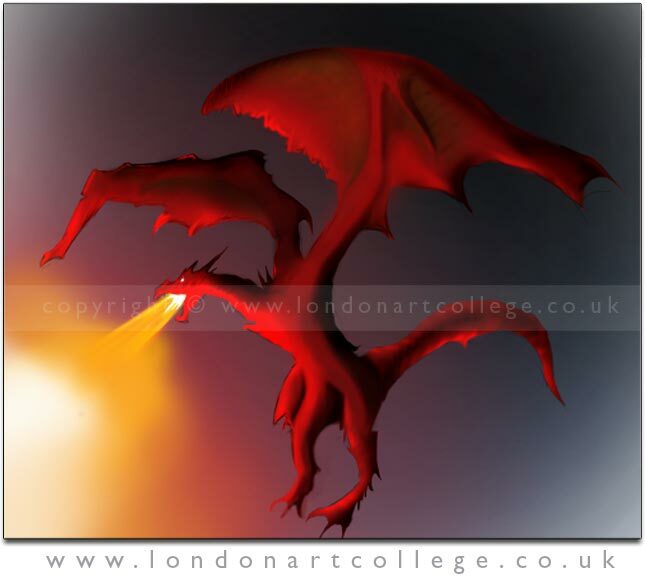 When I signed up for studying at London Art College, I was a bit torn between doing the Science Fiction and Fantasy Art Course, or the Illustrating Children’s Books course – which I am sure would have covered the subject in considerably more depth than the weekend class I attended! If I had chosen to do this course, I might have spent less time struggling with the flow of the story, and coming up with a storyboard – or with determining which age group my book would be suitable for! On the other hand, I found some of the techniques I had learned in the Science Fiction and Fantasy Art course very useful for this project – particularly the research aspect of it, finding good reference images and putting them together into interesting compositions, and also the progression from messy pencil sketch to tidy ink drawing to fully coloured version. I fell these techniques lend themselves really well to working digitally, as I do. A little while ago, one of my artist friends in Europe posted a link to the Key Colours Illustrator’s Award an international award for the best children’s book concept, organized by Clavis, a publisher of children’s books in Belgium. Since it is always easier to work with a deadline, I decided to work toward submitting my book concept for this contest. The contest rules were also helpful in another respect: one of the requirements was to submit a full scale, pencil drawn dummy, detailing all the text blocks and illustrations that would go in the book. I had really been struggling with the idea of drawing up thumbnails for a storyboard, and I ended up finding this solution much better: it also forced me to sit down and plan the whole book, rather than just working on one illustration at a time! Was it worth my while to take the course at London Art College? I think it is a case of “exceeds expectations”. Dylan Strugar is studying on the Digital Illustration Diploma Course (D11) with Spencer Hill and has created this very impressive digital painting. Dylan has written about his piece below, we hope that you find it inspiring! With this piece, I wanted to draw something mystical and then use the dodge tool to really bring out it’s power. So I decided to paint a dragon (which is referenced) and have him breath fire which was my own implement and then have the fire give off a really strong light which hit the dragons body. I also used the burn tool on the back of the dragon to make the contrast between the lights and darks very strong, to give the piece a powerful feeling. I decided not to use a bold outline as I wanted it look a bit more loose rather than neat and precise. Anna Rencz from Windsor Ontario, Canada is currently studying with Alan Dedman on the Beginners Drawing Course. 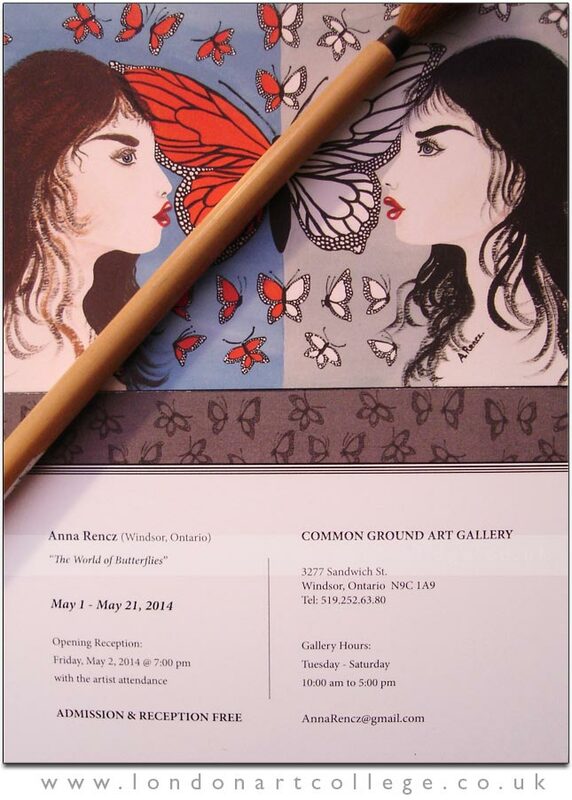 Anna has recently had an Exhibition ” The World of Butterflies ” in May 2014 at the Common Ground Art Gallery in Windsor. 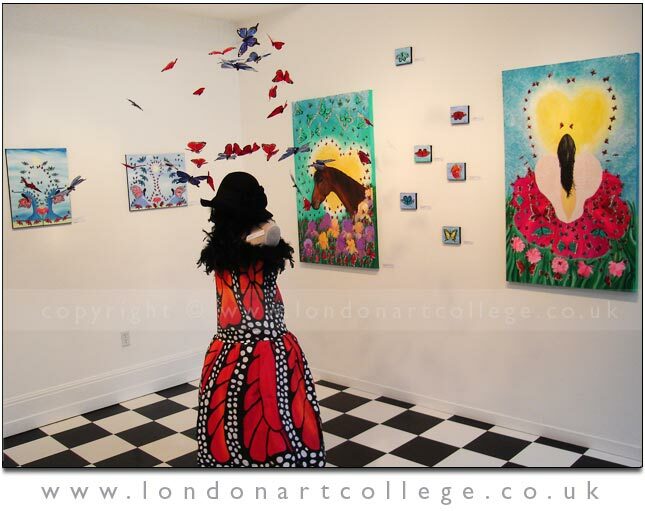 The show presented Anna’s acrylic paintings together with her Book of Poems” The Colors of Love ” published in 2014 and was very well received. We would like to thank Anna for emailing us the spectacular photos, what a wonderful venue to exhibit at. Congratulations! 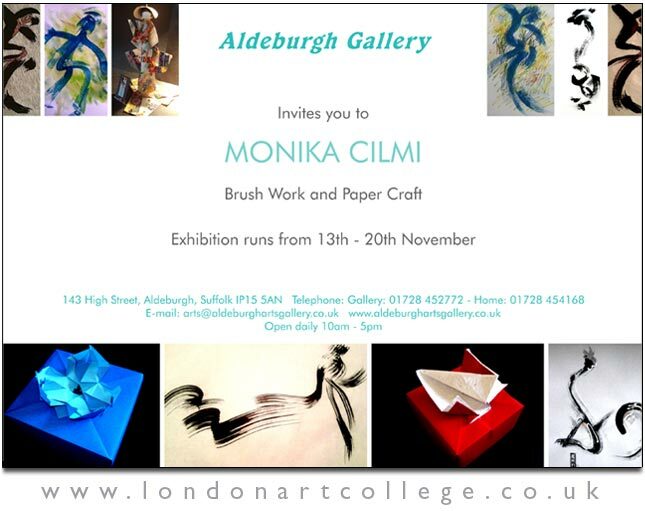 Monika Cilmi, our Chinese Brush Painting tutor is having an exhibition at the Aldeburgh Gallery. Students are welcome to attend if they are in the area. 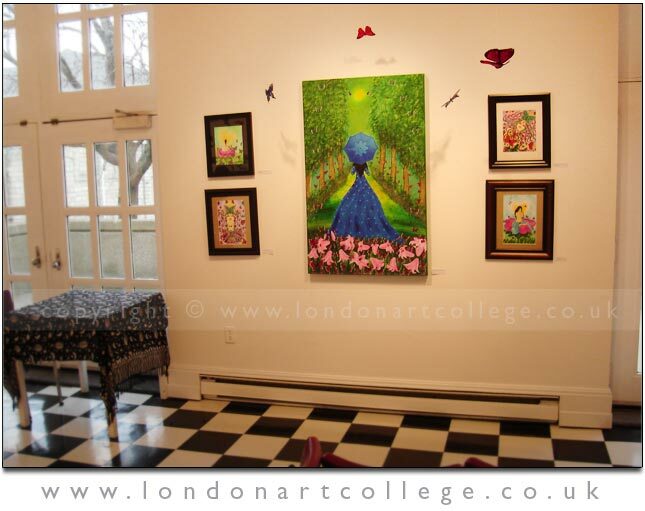 The London Art College Competition 2014 is now complete. The winner is Irina Viatkina and the runner up is Jonathon Cooper and you can see their artwork and read more about them below. We would officially like to congratulate not only the the winners and finalists but all of the students who entered into this years competition. Not only did we have a record entry of 126 but the standard of work entered was phenomenal. It was a really tough decision for all of our tutors to choose just two of their favourites to put through to the finalists phase. You can see all of the entries, finalists and winners artwork at the link below. We are now looking forward to our next competition which will be announced in the coming months! After receiving a great news from Mr. Fisher I’m writing here a bit of my competition piece and myself. First of all I would like to thank LAC for such a great opportunity. I think that it’s very important for us (students) to participate in such competitions. For me it was also a big honor to compete among so many great artworks. My name is Irina Viatkina and I live on Crete, Greece. I grew up in a small town next to St.Petersburg, Russia. As I was a child I study art at local Art School for children which I successful finished at my 15. I didn’t continue my further art education because Economical Schools were more in fashion at that time, but I kept art for my soul as a hobby. Nowdays at the age of 35 I can clearly see that Art is my life and I can’t live without it. 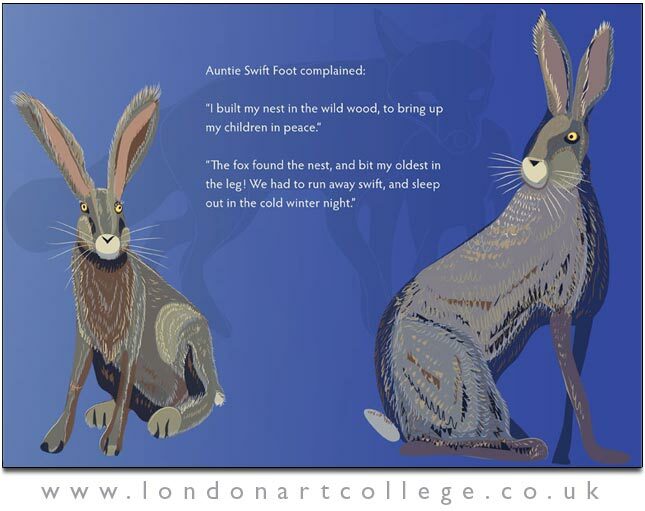 That is why I’m a student again at the London Art College in Illustrating Children’s Books Diploma. The idea to draw orchids came to me this year. I was inspired by some amazing watercolors of artists from China. In my work I decided to combine somehow East and West. It was kind of small experiment. I used only watercolors on 300 gm rough Hahnemuhle Britannia watercolor paper. First came the background with wet-in-wet technique, then flowers followed but with more accurate brushwork. Because I love flowers and especially orchids, my goal in this project was to bring alive this exotic flower spirit which is in the same time tender but bright and wild. 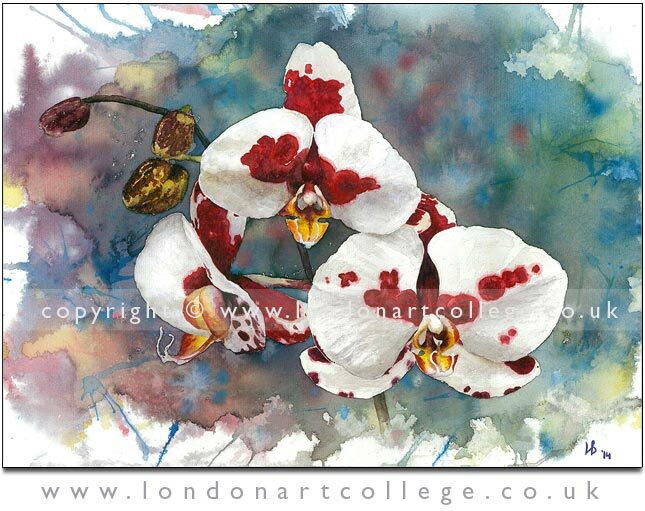 It took me about 40 hours to complete and as the final touch came the title – Orchid Passion. As for my future artwork plans – children’s books world is really fascinating me. The idea to communicate with new generation and to pass knowledge through books is amazing. That is why to become an illustrator and create some great children’s books will be my best future plans! Really pleased to be voted runner up, and its a great honour to be asked to write a few words about the piece. 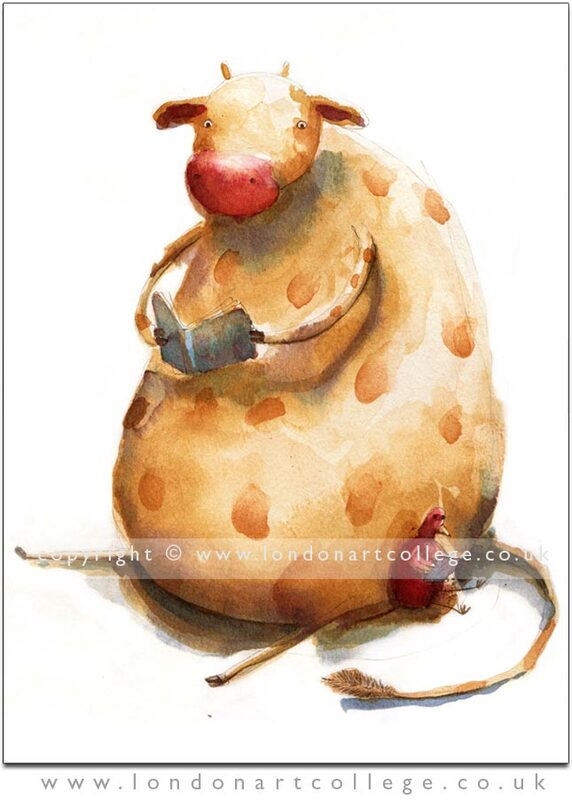 When I painted The Reading Cow it was for Assignment 4 of the Children’s Book Illustration Course that I completed at the end of 2013. I am currently working on producing a Children’s Book of my own on the follow up course, and also establishing myself as a freelance illustrator.…as well as working fully time and raising a family. The Reading Cow started as a bit of practice really and maybe because of this I was able to relax and experiment whilst painting it. I started with a rough pencil sketch (which i left in place) and then applied several washes of watercolour over the top, allowing each one to dry between each application. 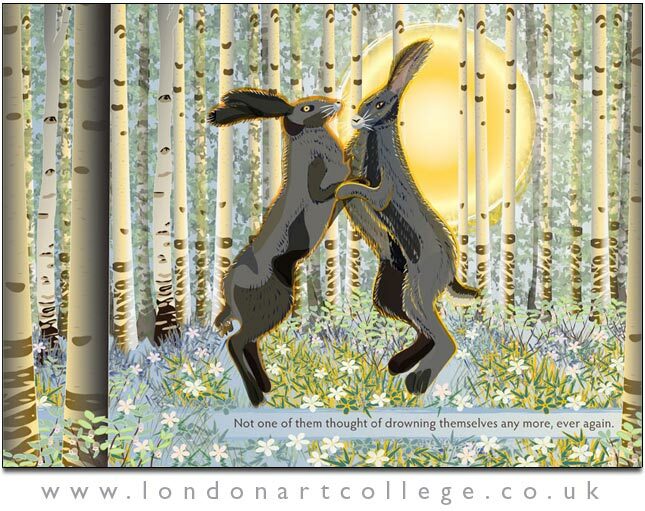 We have a wonderful blog post today with artwork by Alan McMahon who is studying with Julie Douglas on the Coloured Pencil Certificate course. One of Alan’s exercises within the course, asked for a still up along with submitting a photo of the set up, from the angle that he would be drawing it at. This meant that Julie could assess the overall shape, form, colour and texture of the artwork. Alan arranged a cup and spoon, as you can see in the photo below left, along with cloths behind for subtle textures to be introduced within the scene. He was then asked to create a tonal drawing in pencil which you can see below right. Preliminary tonal studies really help an artists to understand the scene before the complications of colour come into play. Here we can see Alan was able to work out where the shadows and highlights were, how deep the tones were, the shape and form of the cup and spoon and also quite importantly how to describe the texture of the cloth behind. Once the tonal study was complete Alan embarked on the coloured pencil finished piece which you can also see below and I think we can all say that it was a huge success. Alan has handled the delicacy of the cup extremely well and the overall colours are beautiful. Congratulations to Alan on a superb piece. Competition Entries are now online to view…. 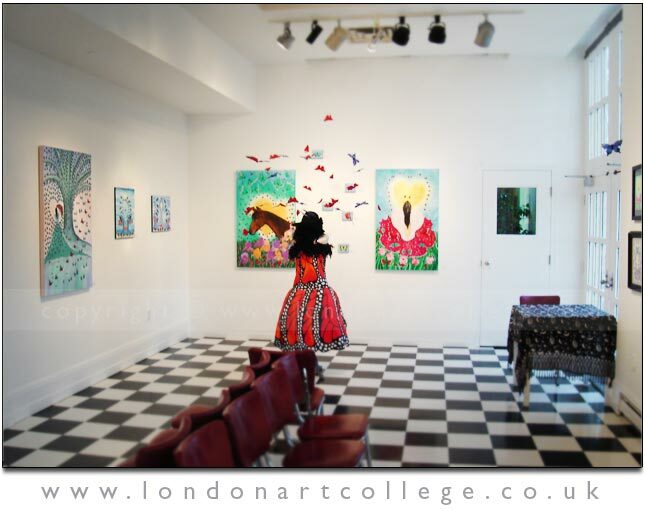 The London Art College 2014 competition is now closed. We have beaten our yearly record again this year with whopping 125 entries! I have collated everything at the link below. Due to the many thumbnails on the page, its best leave it a minute to load before clicking the first thumbnail (depending on how fast your internet is of course), as this means everything will display correctly. Once it has loaded you should be able to click on the first image (Serena Williams) and it will come up in front of the page just like in our new galleries. You can then keep clicking the next button to view each image or you can click outside the image to click another thumbnail of your choice. Students are more than welcome to check out their entry to make sure its displayed correctly and also check out the competition! The finalists will be added next week and the winners will be announces the week after so stay tuned!